1. Preheat the oven to 180°C, gas mark 4. Grease and base line a 22cm square tin. 2. Place the chocolate and butter in a bowl over a pan of simmering water and allow to melt. 3. Meanwhile, whisk the eggs and 225g sugar until pale and fluffy. Stir in the chocolate mixture. Mix the flour, baking powder and cocoa together, and fold into the brownie mixture with the hazelnuts. Pour into the prepared tin. 2 minutes until golden, then stir in the cream and mix. 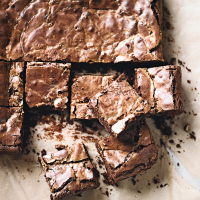 Drizzle over the brownie mixture, then bake in the oven for 35-40 minutes. 5. Allow to cool before removing from the tin, then cut into squares.